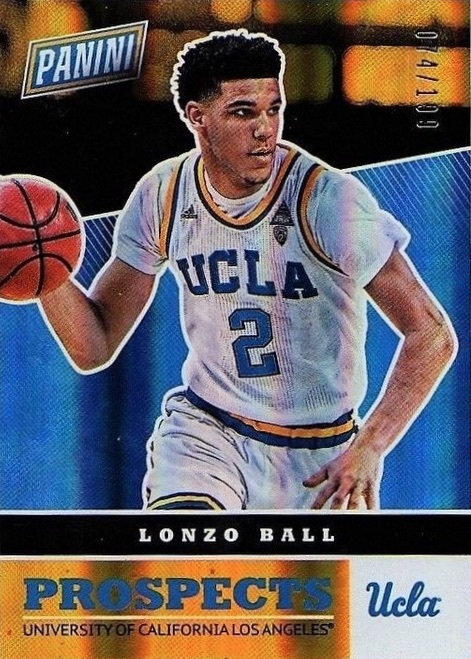 A perfect storm of talent, bravado and media exposure surrounds Lonzo Ball, and by extension, Lonzo Ball rookie cards. The pieces are in place for greatness. While we have no way of knowing how it will turn out, it's sure to be exciting! Even with the clear talent, the meteoritic rise is still difficult to explain, but, quite simply, Lonzo provides the action on the court, and his father, LaVar, more than supplies the talk off it. Some combination of this dynamic managed to take hold of the mainstream press, and later the hobby, and things progressed even further when Lonzo was selected second overall by his hometown Los Angeles Lakers in the 2017 NBA Draft. Shop for Lonzo Ball autographs and apparel on Fanatics. 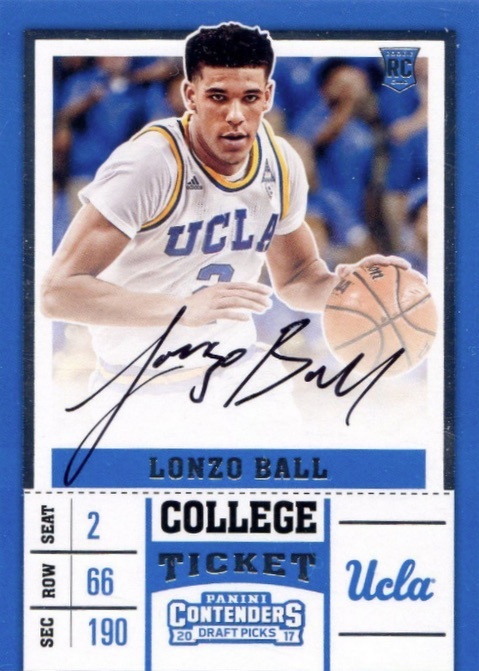 Although collectors had to be patient for their Lonzo Ball rookie cards, the waiting is now over. 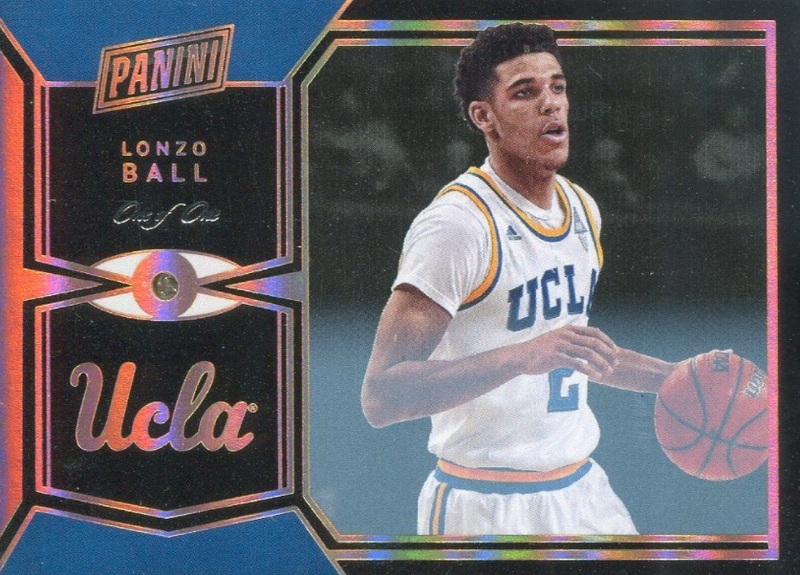 As the sole card company with an NBA license, Panini is the only place to find official Lonzo cards. First came the print-on-demand 2017-18 Panini Instant NBA cards and the 2017 National Sports Collectors Convention promo cards. These were notable in their own right, but the earliest major release came via 2017-18 Contenders Draft Picks, which officially kicked off the NBA collecting year. Don't think the cards are only for Lonzo. Even his outspoken dad signed some cards for Leaf, which can be seen on eBay. 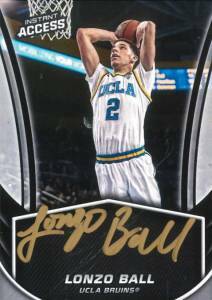 Many more Lonzo Ball rookie options are expected over the course of the season, and all announced set details are featured in our 2017-18 Basketball Card hub. The first pack-pulled NBA cards for Ball arrived in 2017-18 Panini NBA Hoops. 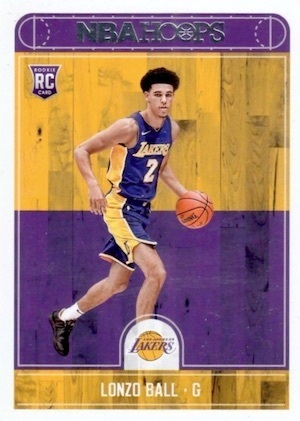 The court-themed design displays the familiar colors of the Lakers on a base card that is plentiful, but that will remain one of his most popular overall options as time goes on. 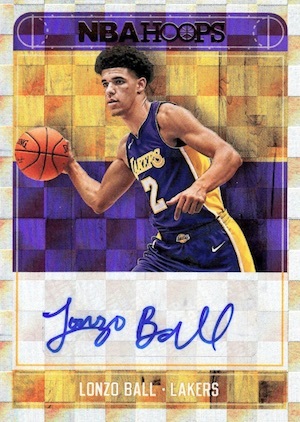 In addition to his inclusion in several of the inserts, Lonzo Ball rookie autographs come in the main signed set and Hot Signatures line. 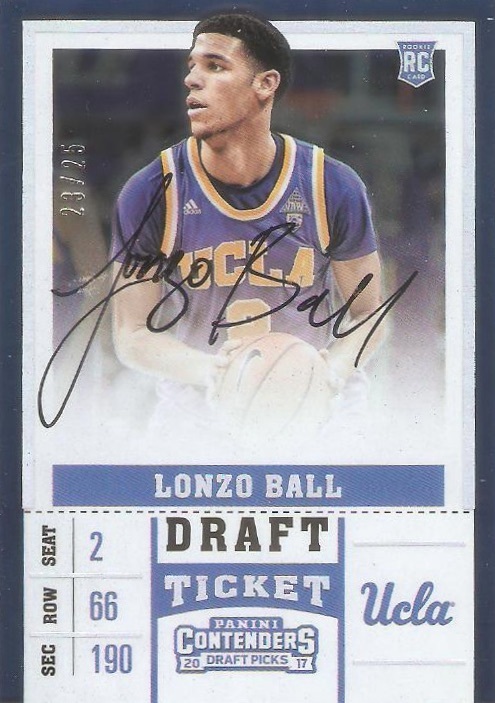 After waiting for what seemed like an eternity, 2017-18 Contenders Draft Picks brought with it the first new basketball set of the season, and, of course, the first traditional, pack-pulled Lonzo Ball rookie autographs. On top of that, Ball came in the RPS (Rookie Photo Shoot) subset so his College Ticket autographs are each hard-signed. While all options have strong value, there are actually four different image versions plus multiple Ticket parallels for every choice. The base version in the white jersey is shown first, followed by the A, B and C variations, which are noted as such on the card backs. 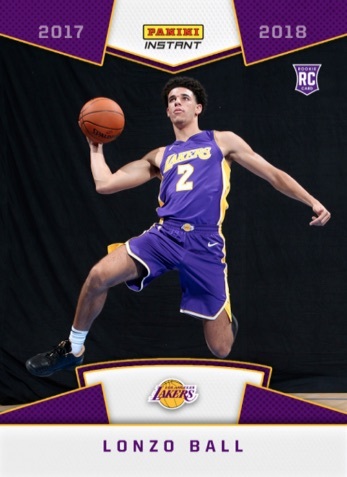 Among the most popular print-to-order cards for Lonzo, the Rookie Photo Shoot First Look set in 2017-18 Panini Instant NBA is the debut for Ball in his Lakers jersey. It also adds the RC logo. A print run of 3,289 copies means most should be able to obtain one with relative ease. In addition, low-numbered parallels include Green (#/10) and the one-of-one Black. 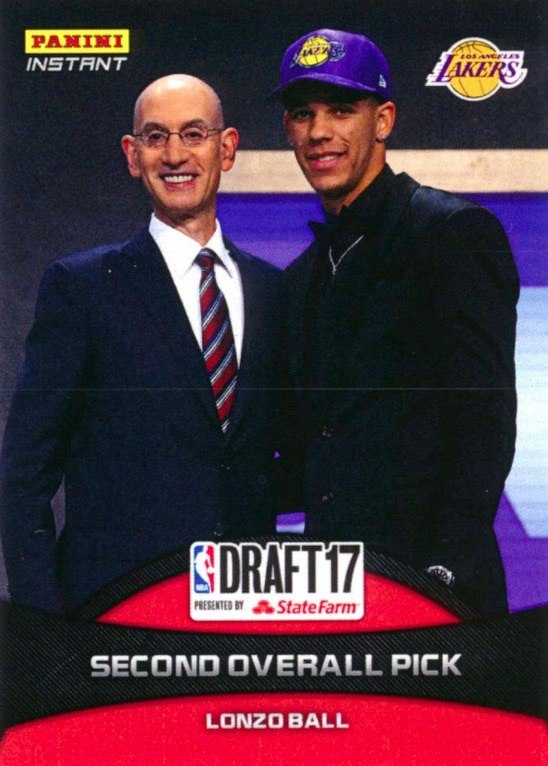 Issued shortly after his draft selection, the on-demand 2017-18 Panini Instant NBA provided collectors their earliest Lonzo Ball NBA card. While the final production of 1,251 copies allows for decent supply, first means something to collectors and values have climbed. More limited are the Silver (#/25), Green (#/10) and Black (1/1) parallels. 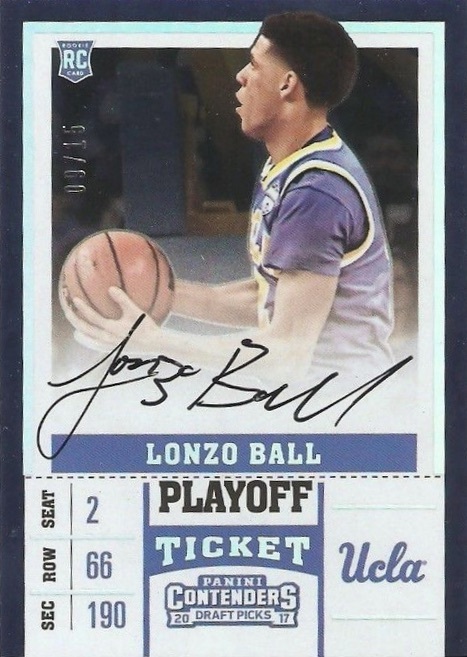 Extreme rarity is not enough to blunt the allure of the first Lonzo Ball on-card autograph. However, with only 10 Green copies and a one-of-one Black version, collectors have their work cut out for them. This is another example of the on-demand Instant brand in action. 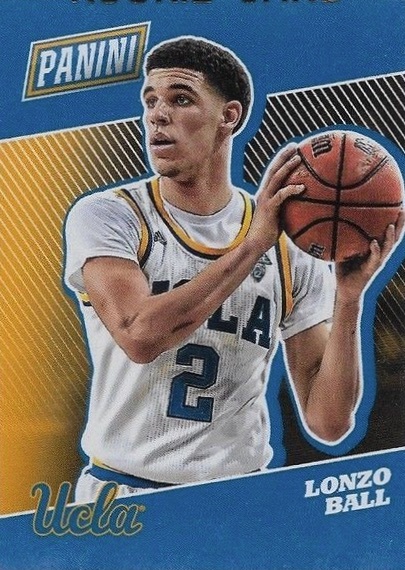 Collectors who made it to the 2017 National in Chicago were treated to a large assortment of early Lonzo Ball rookie cards. 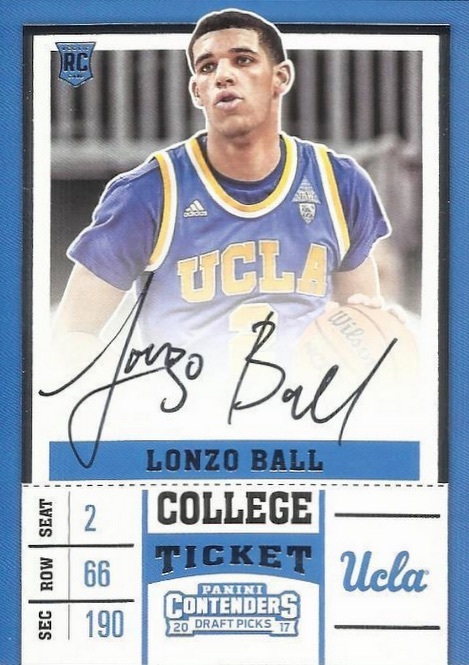 All featuring his UCLA gear, Ball was found in the VIP ticket package set, main wrapper redemption packs, and VIP party set from Panini, which also included a separate VIP Gems insert card containing a diamond. While most of the premium options featuring sticker autographs and relic pieces are low-numbered, collectively the NSCC cards provide a strong selection for the young star. They also offer a starting place for many fans who prefer packs to the online segment of collecting.